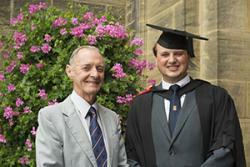 Josh with his Grandfather, who also graduated from Bangor in the 60sAfter an astronomical amount of effort, a Bangor University student has followed in his grandfather’s footsteps and graduated this week. Joshua Baker, 21, from George Town, Grand Cayman, Cayman Islands graduated with a BSc Psychology with Neuropsychology degree from one of the UK’s leading Psychology schools. Originally from Cornwall, Josh and his family moved to the Cayman Islands just over ten years ago. Josh had heard many great things about Bangor University as his grandfather had studied Electronic Engineering here back in the early 1960s. Even though Josh lives on a beautiful Caribbean island, he still found the natural beauty of north Wales breath-taking. Pleased with his achievement, Josh said: “When the time came to start looking for a university, I researched into my subject and found out about Bangor’s strong reputation in the field of psychology. I also have family in the area, which helped in making such an important decision. “The course was amazing and I’ve met some truly remarkable people during my time at Bangor. I was an avid member of Psych Society and served for the club as the International Officer. I also managed to find time to participate in the Ukulele Club, and was a member of the University Squash Team in my first year. “Although I had a wonderful time, there were two significant obstacles that I had to overcome during University. Moving back to the UK was a huge change from the small islands that I had grown up in for most of my life. This change was greatly helped by the University staff, but mainly I got through due to the wonderful support of my family in north Wales, whom I cannot thank enough. “The other major obstacle was overcoming the constant annoyance of Dyslexia. My Dyslexia means that I am more prone to mistakes, particularly in reading, which can be disastrous in assessments; this made everything harder than it needed to be it. Luckily for me though, the Miles Dyslexia Centre were able to provide me will all the support that I needed to succeed. View a short interview with Josh.